Q How can I register? 1) Online - Simply visit our official website at www.ap-valves.com and type all the required information. 2) E-mail - Fill in the registration form with your details and send it to cvrf@summitmd.com. Q How much does it cost to attend the conference? 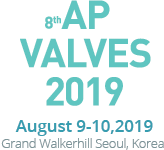 The fees for the 8th AP VALVES 2019 will be waived irrespective of types of occupation. Q Is it possible to cancel my registration? Please let us know the cancellation no later than July 26, 2019. Q How can I obtain a registration confirmation for the registration? The registration confirmation will be automatically sent to the registered email address. So, please provide us with your correct email address during the registration process. Q When will I receive my name badge? Q Can I get into the conference without my name badge? Q How can I make a reservation for hotel? All attendees are responsible for booking their own accommodation. However, we have discounted rates contracted with several hotels near the venue. Don’t forget to reference “AP VALVES" to receive the special rate. A limited number of discounted rooms have been reserved for attendees who make their reservations early. Please check housing page on the site for further information. Q Where can I get a visa letter? We can send the invitation letter to those who are registered and whose payment has been verified. Please send a request by email to cvrf@summitmd.com.